M.B. Rajesh is one of the active members of Parliament from Kerala. He has been in office since 2009. He entered into the political arena in the Kerala state though his active participation in the Students Federation of India (SFI). Through his selfless effort and active participation, he slowly moved through the rank and file of the youth wing of the Communist Party of India - Marxist (CPI-M) to become one of the influential members of the party. Since he is very much interested in the parliamentary politics and a shrewd decision maker, he has been made the honorary member of many parliamentary parties that travel to different parts of the country to ascertain the views. M. B. Rajesh was born to an aristocratic Nair family on March 12, 1971. His parents were Shri. Balakrishnan Nair and Smt. M.K. Remani. He is the eldest child in the family. He was born in Jalandar, Punjab, as his father was working there in the government service. His family hails from a place called Shoranur in the Palakkad district of the Northern Kerala. When he grew up, his family moved back searching for the ancestral root and got settled in Kerala. The young Rajesh had his formal education in his birthplace, which was Jalandhar in the state of Punjab. Later, he had his higher secondary education in the same city, as his father was employed over there. Right from the childhood, he was more studious and serious about his studies. That was the reason he could get good marks and grades for his SSC examination. During his school days, he was at the forefront of various movements that aimed to take up issues relating to the students' community. However, it was not that extensive due to the curbs introduced by the school authorities. After his higher secondary education, he moved to Kerala and continued his education there by enrolling himself for a pre-degree course at a reputed junior college near his ancestral house, near Shoranur in the Palakkad district of North Kerala. While working in the junior college, he became the active member of the students' wing of CPI-M party SFI and participated in the various movements that took place in the region. He could devote enough time between his academics and political activities. Because of this reason, he could get sufficiently good marks in pre-degree examinations. After the successful passing of pre-degree course, he enrolled himself for his graduation at the coveted N.S.S. College Ottapalam, a place near his ancestral house in Palakkad district. The specialization he took for his graduation course was Economics. He has been mostly in the same field since his pre-degree college days. He continued his political activity along with his academics judiciously. So, towards the fag end of his degree course, he carved himself a political space in the students' wing of the party and a good subject knowledge through his persistent learning habit. This trait held him in good stead when he got opportunities to participate in party and public debates. As a result of persistent preparation for the examination and subject knowledge, Rajesh could successfully deal with the degree examinations and came out successful with good percentage of marks. Due to the good marks at degree level, he could easily secure a seat at the same college to pursue his postgraduate course in his chosen specialty. With the help of senior faculties, he worked hard to get his project work done in time to submit for its evaluation. This thing he could do despite his busy engagement with the party he was affiliated to. Due to his meticulous preparation, the young Rajesh could garner good marks and percentage for his post graduate examinations. Later, he did his L.L.B. course from Kerala Law Academy in Trivandrum, the capital city of Kerala. While he was meeting different people in public fora organized by the party, he happened to come across his future love Ninitha. At that point in time, she was doing her research in Malayalam literature. She was also the member of the central secretariat of SFI. She was also the chairperson of the Calicut University Students Union. Their courtship continued for some time. After she got into a teacher's job at a reputed college, he proposed to her. With the mutual consent, they decided to enter into the institution of marriage. So, they married each other. They have a 5-year-old daughter from their marriage. Her name is Niranjana. Comrade M.B. Rajesh started his political life while he was a school student. Moved by the slogans and the ideas the left parties stood for, he directly took the plunge into the students' politics. The rallying point of such movement was the Students Federation of India (SFI). With the help of senior student leaders, he organized various events and movements at the school level. However, the participation at the school level was rather limited. After he moved to Kerala with his family, he became an active member of SFI. By the time, he resumed his activity as an active member, he had enough contact with the people in the political establishment. Under their patronage, he organized successful political movements that were aimed at bringing some change in the society, especially at the local level. Through his hard work, he slowly moved up the party hierarchy. At every stage of his political transformation, he made more contact and more contributions to the party. In recognition for his tremendous contribution to the cause of the party, he was elevated to the national level. As a result, he became the President of the student's wing of CPI-M at the national level. Later, the Politburo of the parent party brought him to the state unit of SFI as its State Committee Secretary. When he was climbing the ladder of hierarchy in the students' wing, he also held other important positions that include those of Joint Secretary and Vice President of the Central Committee. After his student life and activities in SFI, Rajesh joined the Democratic Youth Federation of India, a youth wing of the CPI-M. As an active member and organizer of various events in DYFI, he led many struggles against the commercialization of education. As a result of this, he was arrested and brutally assaulted by the state police during agitations. On many occasions during this struggle, he was arrested and remanded to judicial custody several times. Again through his hard work and organizing abilities, he became a cynosure of every body's eyes in the party. Hence, the decision-making body of CPI-M, lifted him from the rank and file of the youth wing of the party to give him the responsibility of running the state unit of DYFI. He is currently holding the same post, actively leading the party using his political acumen. Presently, comrade Rajesh is serving as a district committee member of Palakkad unit of CPI-M.
As a Member of Parliament, Rajesh has visited several countries, including Cuba, Russia, Algiers, France, etc. During his college and school days, he was part of the student delegation from India that visited Cuba to participate in the Cuban solidarity meet. Right from the childhood, M.B. Rajesh had an opinion of his own on any topic he learned, heard or saw. In order to fuel his thoughts, he started reading books from various specialties. This learning process helped him to present his points effectively in various platforms, be it political or apolitical. After successfully presenting his thoughts, he thought about putting these thoughts in his manuscripts to enable the future generation to learn better, without any political affiliations. Hence, he started writing books on various topics about which he learned and analyzed. He has also written several articles that have been published in leading journals and dailies in the country. These articles and books cover the various aspects of Indian socio-political sector. 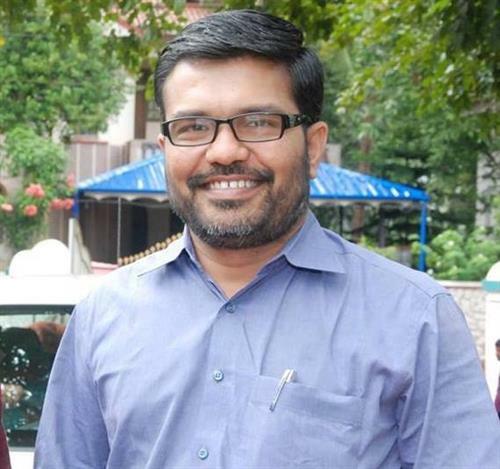 Currently, he is serving as the Chief Editor of Malayalam Monthly Yuvadhara. Prior to this, he held the post of the Chief Editor of Monthly Students' magazine during 2000 to 2002. Following are the works published by this young MP from Kerala. A collection of articles on education that talk about the pros and cons of privatization of education in the state. This article collection is titled as History Will Hold Them Accountable. This collection was published in Malayalam in the year 2002. A collection of articles on globalization stating its contradiction in principles. This collection was written in Malayalam. The book was published in the year 2008. A collection of articles in Malayalam that speak about the harmful effects of Global recession. This article collection also talks about its impact in global economy. This article compilation was published in the year 2008. A Report Card on the work of M.B. Rajesh as Member of Parliament was released recently. The report showcased the work undertaken by him in last four years. During the occasion, the former state minister and CPI-M state secretariat member A.K. Balan released the document by handing over a copy to V. Chamunni, the district convener of the Left Democratic Front. The progress report spoke in detail the important public issues handled by him and developmental works undertaken up by him. The report also gave the amount he availed from the MP's discretionary fund to develop the places in and around the Palakkad Lokh Sabha constituency he represented. Speaking on the occasion, A.K. Balan told the gathering that Rajesh had spent more than 100% of his Local Area Development Fund in first three years of his term. The report also spoke about the amount that was spent on various development activities undertaken during his last four years in office. According to the report, the amount spent on development activities in his constituency was Rs. 947 crores. M.B. Rajesh is a seasoned politician hailing from the state of Kerala. He rose to the top of the party rising through its rank and file. He has a lot of experience in handling public issues. He started his political activities, right from his childhood. Under the patronage of the senior student leaders, he participated in various movements to address the issues plaguing the student fraternity. However, the kind of participation was rather muted in his school days. After migrating to the Kerala state, he started to participate in SFI sponsored mass movements against the privatization of the education sector in the state. As a result of this, he courted arrest on several occasions. On those occasions, he was remanded to judicial custody and sent to jail. Through such successful student movements, he slowly climbed the hierarchy of the students' wing to reach its topmost position, the post of the President of SFI national committee. Later, he worked as the Secretary of SFI's State Committee. Going further ahead and graduating one step further, he became an active member of DYFI. In a short span of time he rose to the top post of DYFI. This article gives a clear picture how a political personality is self groomed. Rajesh is definitely an example to be copied by any person who want to do something useful to the society. He is intelligent and hard working. He easily mix up with common people and never pretend as a 'super man', as many of the politicians do. He makes us feel that he is one among us. A very great future is waiting for Rajesh, no doubt.